It is also suggested that they should not share the same bed but they should have their own. The studies show that in this way, the risk of this syndrome is reduced by around 50%. 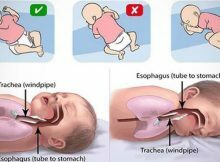 The exact reason responsible for SIDS it is still unknown but the examples show that children usually die as a result of suffocation while asleep. The Center for Disease Control and Prevention point out that every year in US there are around 3500 deaths of infants from SIDS. This makes around 40% while other death from accidental suffocation, sleeping-related mishaps take up around 25%. This type of syndrome usually occurs among six months old children. This can occur as a result of some apparatus in the sleeping area near the children such as toys, soft pillows, furnishings, little parts and many others. They can block the breathing passages due to asphyxia. Another reason is some genetic defect that the child may be born with that, which can obstruct the vulnerable nasal passages and cause difficulty breathing. Also, because of tiredness the mothers can fall asleep during breast-feeding thus leading to death of the infant. It is more dangerous when the mothers breast feed the children in an arm-chair with no surrounding support in the case they fall. Will Sharing the Same Room Keep the SIDS Away? The closer are the children to their parents, the more alerted they are. They can keep an eye on the baby, if it is crying or making some odd noises so they can immediately react and save its life. The babies will feel safer if they are not alone in the room and the sense of parent’s presence will make them comfortable. The babies and parents should not share the same bed because the adult bed is not made for the baby needs. The pillows, blankets and duvets can do a great harm to the baby. So, it is much better to keep the children in a separate bed. The crib is the best sleeping place for the children because they can’t roll of. They have to be placed on their backs on a firm surface in order to get the needed back support. They also need a sheet that is tightly set so that it can’t unravel when the babies roll around. There should be no blankets, pillows or bed furnishings which can make them feel hot or even suffocate them.